‹ How Are Puer Cakes Made? This year’s tea tour marks 11 years of Seven Cups providing professional-level education on the ground in China. Every year is different, and every detail gets planned by our own Zhuping Hodge. So, after months of planning, it’s exciting to see the trip take off. 2018’s tea tour has just passed its first leg, traveling from Kunming into Yunnan’s southern tea producing regions. After days of visiting sheng and shu puer tea producers along their route, the travelers appear to be getting quite adept at evaluating mao cha and pressing their own puer cakes. The pictures below are roughly chronological and cover the tour’s journey from Jinggu County, on to Jing Hong, and You Le Shan. Puer tea being prepared for compression with steam. Tea tour guests compressing their own shu puer cakes in Jinggu. 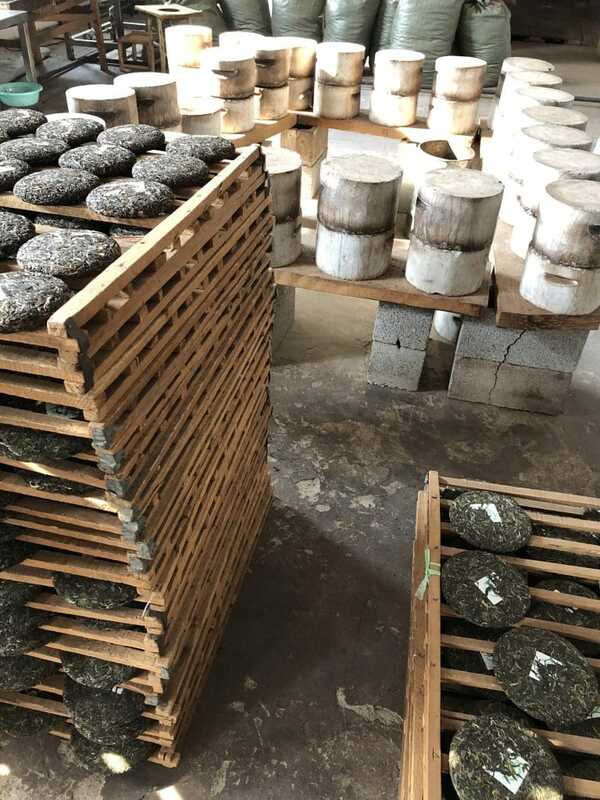 Completed puer cakes on their drying racks sit next to stone compression molds. A massive stack of unwrapped shu puer tea cakes awaiting their destiny in the Jing Gu tea factory. The piling and ripening of a batch shu puer. Note the thermometers inserted into the top of the pile to monitor internal temperature. Zhuping is standing in for scale. Visiting some older tea plants on You Le Shan. Plucking here began as early as February this year, but the older trees weren’t plucked until the end of March. You Le Shan tea maker, Mr. Li Chun Kai, is assisted by his family. Taking in the aroma of the freshly fired leaf. Mr. Li helped the travelers press their own cakes of sheng puer using the traditional stone molds. Catching sunset in Jing Hong before heading back north and on to Guizhou!